Hawaii’s quilts are beautiful cloth art expressions that developed in the Hawaiian Islands between the late 1700s' and nineteenth century. Hawaiian quilts developed from the Polynesian settlers with influence from American quilts introduced from missionaries and new comers soon after the islands’ were discovered in the 1700’s. Although Hawaiians were also introduced to patchwork quilting by the missionaries, they choose to create their own style. 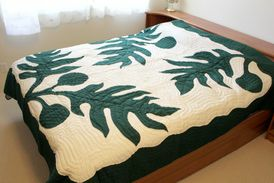 Using scenery, flowers, trees and even special events to create their own designs, Hawaiians use the appliqué method and echo quilting style to make quilts. These quilts were treasured by generations of families, as each was made with a lot of love and Aloha. 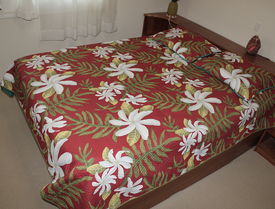 Bed Hawaiian quilts were and are today very special creations. Over time they have evolved into works of art that reflects the stunning natural beauty found in Hawaii and the unique history of its people and culture. Hawaiian quilts are regarded as prized family possessions often handed down from generation to generation. The designs and methods that make Hawaiian quilts are very different from American quilts. Although the islanders were introduced to American quilts Hawaiians knew how to work with cloth and sew before outsiders discovered the islands in the 1700s’. Long before the introduction of cotton and other fibers into the islands the Hawaiians learned how to make their own cloth from the bark of the paper mulberry tree. This material was called tapa made by pounding the soft bark of the paper mulberry tree together. As the mulberry tree fibers were pounded tightly together they meshed into a thick cloth material. The tapa cloth could then be colored with natural dyes from berries found in the environment to give the cloth color. Needles were made from fish and bird bones or hard wood. Thread was made from twisted fiber from the bark and vines of other plants. The process took a long time and patience to complete. The tapa cloth found many uses among them were clothing, bedding and quilts. Today Hawaiian quilts are still made by hand and some can take as long as three years to complete. The work is very intricate and painstaking. Up to 200,000 to a million hand stitches can go into creating a masterpiece Hawaiian quilt. We combined the sewing machine and hand stitching together, the sewing machine folded the raw edges of the designs and stitched them to the background, the other stitched are hand stitched. Today with the combined use of a sewing machine and hand stitching bed Hawaiian quilts will take an average of two to three months for one person to complete depending on the design. 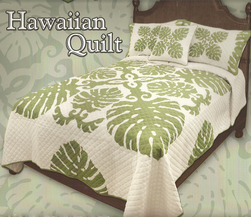 The Bed Hawaiian quilts we carry are designed here in Hawaii by a local graphic artist who takes his designs overseas to his Hawaiian quilt factory specially set up in China to make these Hawaiian Quilted comforters by hand stitching and sewing machine. These Hawaiian quilts are made in China where the manufacturing process keep costs down without sacrificing quality. The savings allow us to offer these outstanding quilt comforters at a special price. Special note on displayed colors. your computers monitor, graphics card and settings can affect the colors displayed. For best viewing we use standard monitor settings: 1024x768 pixel, color palette= 256 colors or higher, font size= small. Click on the pictures below for ordering options.